Today the Church celebrates the memorial of St. Cecilia, virgin and martyr. 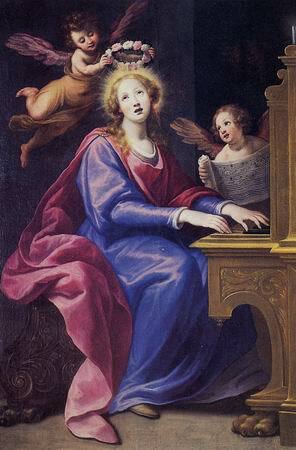 St. Cecilia is one of the most famous and most venerated of Roman martyrs. Her body was discovered in 822 and transferred to the title church that bears her name in Trastevere in Rome. It is difficult to determine the date at which she lived. The legend which recounts the Saint's martyrdom and that of her husband St. Valerian, as also of St. Tiburtius, her brother-in-law, places her martyrdom in the pontificate of Urban I (222-230); but the authenticity of this account cannot be established, nor can we be sure of the persons who suffered with her nor of the date of her martyrdom. Cecilia was so highly venerated by the ancient Roman Church that her name was placed in the Canon of the Mass. Already in the fourth century there was a church of St. Cecilia in Trastevere, erected on the site where her home had stood. Her martyrdom probably occurred during the reign of Emperor Alexander Severus, about the year 230. In 1599 her grave was opened and her body found in a coffin of cypress wood. It lay incorrupt, as if she had just breathed forth her soul. Stephen Maderna, who often saw the body, chiseled a statue that resembled the body as closely as possible. 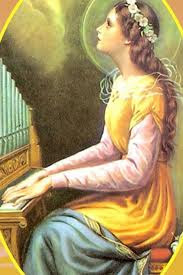 Since the Middle Ages, Cecilia has been honored as patroness of Church music, a practice having its source in a false application of a passage from the Office (cantantibus organis). Cecilia led a life of prayer and meditation and had vowed lifelong virginity, but a youth by the name of Valerian, relying upon the approval of her parents, hoped to marry her. When the wedding night arrived, she confided to Valerian, "There is a secret, Valerian, I wish to tell you. I have as a lover an angel of God who jealously guards my body." 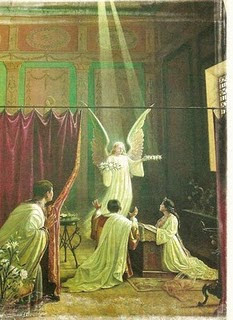 Valerian promised to believe in Christ if he would be enabled to see that angel. Cecilia explained how such was impossible without baptism, and Valerian consented to be baptized. 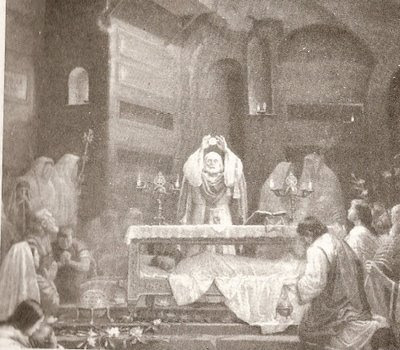 After he was baptized by Pope Urban and had returned "He found Cecilia in her little room lost in prayer, and next to her the angel of the Lord was standing. When Valerian saw the angel, he was seized with great terror." The angel handed to them a bouquet of fiery red roses and snow-white lilies as a reward for Cecilia's love of chastity, a bouquet that would not wither, yet would be visible only to those who love chastity. As a further favor Valerian besought the conversion of his brother Tiburtius. Upon arriving to congratulate the newlyweds, Tiburtius was astounded by the unspeakably beautiful roses and lilies. As soon as he was informed regarding their origin, he too asked for the waters of baptism. "St. Cecilia said to Tiburtius: Today I acknowledge you as a brother-in-law, because the love of God has made you despise the idols. Just as the love of God gave me your brother as a spouse, so it has given you to me as a brother in-law." When Almachius, the prefect, heard of the conversions, he ordered Maximus, his officer, to arrest and imprison all of them. Before being put to death, they instructed Maximus and his family, and baptized them during the night preceding execution. At dawn Cecilia roused the two brothers to struggle heroically for Christ, as the glow of morning disappeared, Cecilia called: "Arise, soldiers of Christ, throw away the works of darkness and put on the armor of light." Cecilia pursued her victory as the soldiers willingly listened, "We believe that Christ is the true Son of God, who has chosen such a servant." Led before the prefect, she professed her faith in Christ, "We profess His holy Name and we will not deny Him." In order to avoid further show, the prefect commanded her to be suffocated in the baths. She remained unharmed and prayed, "I thank You, Father of my Lord Jesus Christ, that through Your Son the fire was extinguished at my side." Beheading was next in order. The executioner made three attempts (the law prohibited more) and let her lie in her blood. She lived for three days, encouraging the poor and dedicating her home into a church.